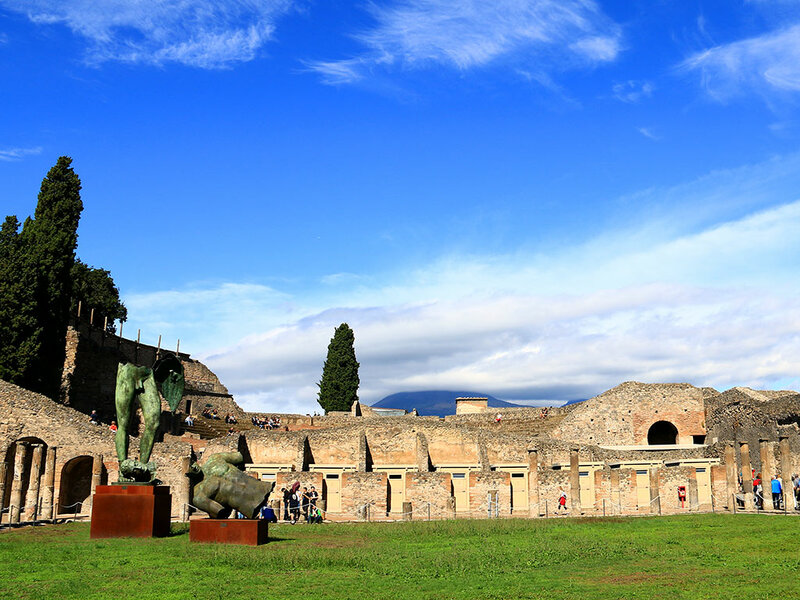 Great for history buffs and photographers, this unique tour lets you take in the best of the Campania region’s most famous sights: First yo'll take in the uniquely preserved ancient city of Pompeii, which was buried by the eruption of Mount Vesuvius in the 1st century, then you'll stroll the graceful alley's of Positano and finish off with a view from sea of the dazzling land-and seascapes of the Amalfi Coast. You'll be met by our greeter at the Rome trains station to assist you with your train to Naples. In Naples, accompanying you will be an expert, English-speaking guide, whose knowledge will deepen your appreciation of these remarkable destinations. Exclusive greeter at the Rome Termini station to assist you in getting to your train. You’ll begin your journey at 7:15 a.m. at Rome Termini train station, once you’ve boarded your high-speed train to Naples. After a little more than 1-hour ride, you’ll meet your guide at Naples Centrale and transfer to the Campania Express train bound for Pompeii. When the volcano of Mount Vesuvius erupted in 79 A.D., it not only completely buried this adjacent city—it preserved it. Today, the excavated ruins here comprise one of the most remarkable ancient sites in the world. Along with your guide, you’ll get to roam here through the temples, houses, theaters, and even brothels where ancient Pompeiians once spent their days—and see the haunting plaster casts of their remains. After your tour, you’ll board your coach for the trip the Positano Village. When the volcano of Mount Vesuvius erupted in 79 A.D., it not only completely buried this adjacent city—it preserved it. Today, the excavated ruins here comprise one of the most remarkable ancient sites in the world. Along with your guide, you’ll get to roam here through the temples, houses, theaters, and even brothels where ancient Pompeiians once spent their days—and see the haunting plaster casts of their remains. Some of the most gorgeous scenery in Italy lies along the Amalfi Coast, a 30-mile stretch south of Naples, where tiny villages cling to sheer cliffsides above the glittering Tyrrhenian Sea. You’ll board a ferry in Positano that will give you the opportunity to cruise along the Amalfi Coast and have the chance to take unforgettable photos of th town of Amalfi. The ferry will drop you off in Salerno, where you will board the Campania Express train for your return to Naples and Rome.